Designed by Don Chadwick and Bill Stumpf, the Herman Miller Aeron chair has distinguished itself as the the most popular office chair of all time, significantly outpacing all other office furniture. The choice of Fortune 500 companies, technology startups and Hollywood movie sets, the Aeron is the rare office chair that not only provides supreme ergonomic comfort and support, but serves as an internationally recognized symbol of luxury and wealth. Produced since 1994, the Aeron has proven to be one of the most durable chairs on the market, as the high quality of materials and superior craftsmanship make the Aeron a great investment for professionals seeking the unique combination of high-end design, reliability, stability and high performance. Simply stated, the Herman Miller Aeron is the chair companies and individuals buy when money is no object. 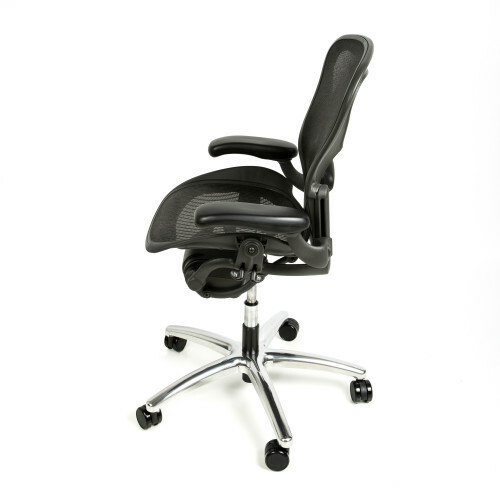 With our affordable pricing, you can treat yourself and your back to the chair that has been awarded Businessweek's prestigious Design of the Decade award and has been on display at the Museum of Modern Art's permanent collection since 1992 without breaking your budget. The Herman Miller Aeron Chair Fully Adjustable with Polished Aluminum Base comes in the classic and most popular color; in all three sizes: A, B and C; with the features that will your make your seating experience all the more flexible, enjoyable and ergonomically sound: fully adjustable arms, tilt lock and lumbar support; and with the added benefit of a polished aluminum base that will elevate your chair into even more of a showpiece. 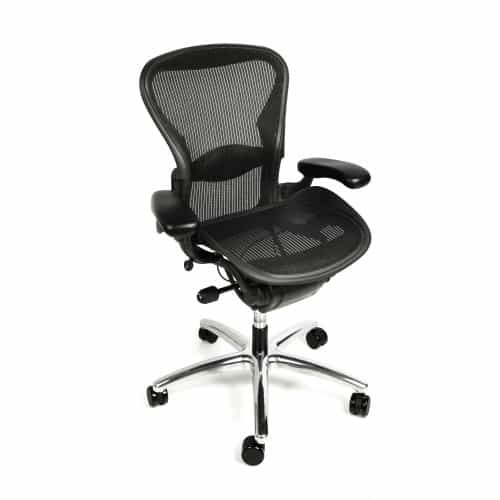 The Herman Miller Aeron Chair Fully Adjustable with Polished Aluminum Base is especially popular among those seeking optimal aesthetics, from design enthusiasts to executives and office managers intent on a picture perfect Herman Miller Aeron chair. Enjoy the luxury and comfort of the chair that corporate executives, producers and health-care professionals have been selecting for decades, while saving a significant amount of money by buying from Beverly Hills Chairs. 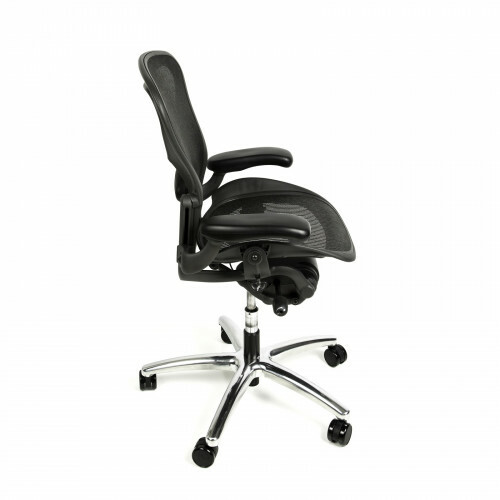 Polished Aluminum Base: The polished aluminum base makes your chair all of the more all the more luxurious and aesthetically impressive. My recent purchase from Beverly Hills Chairs was one of the best that I’ve made. My brother-in-law has a Herman Miller chair at his job and suggested that I look into purchasing a chair that has been proven to last. I checked out the inventory online at Beverly Hills Chairs and was able to select the perfect chair. The Herman Miller Aeron office chair that I recently purchased turned out to be really great. I didn’t want anything poorly made so I decided to go with a reputable company. I made a good choice. I would totally tell anyone who’s shopping for a quality piece of office furniture, to check out Beverly Hills Chairs. I bought a Herman Miller Aeron chair a couple of weeks ago. The customer service rep that I spoke with was very knowledgeable and answered my questions with ease. Thanks again, BHC! I was a bit skeptic about buying a chair online but this Herman Miller Aeron Fully Loaded office chair is great! It's firm and comfortable. The price was right and the quality is well beyond what I imagined. I am truly impressed with the comfort and quality of my new Herman Miller Aeron office chair. I had a couple of questions about my purchase so I called customer service. The person I spoke with was very polite, professional, and patient.